As I noted back in January, fellow crime fiction enthusiast and blogger Dorte Jakobsen of Denmark-based DJ's Krimiblog has started a 2010 Global Reading Challenge, which encourages participants to read from a wide variety of countries in the coming year. Expert Challenge: as above, plus two novels set in Antarctica. 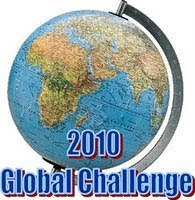 After reading an applicable book, participants make a comment on their own blogs (if they have one), which they can link on the main 2010 Global Reading Challenge website, under the applicable continent. That way a large database of reviews of (crime) novels from all around the globe will also be built up by participant, which will be very interesting. The challenge is being administered by Dorte and fellow antipodean crime fiction blogger Kerrie of Mysteries in Paradise. As I noted on Friday, I've been going fairly well on the international crime fiction reading front in the first couple of months of the year, and I'm already nine fourteenths of the way through the 'Expert' challenge, having now completed North America, Australasia, Africa, and Europe, and being halfway done with Asia. So for the official expert challenge, I only have five books to go: one Asian, two South American, and two Antarctica-set crime novels. However I will of course read far more books this year, and may 'replace' a couple of my 'entries', so to speak. But while the reading has been going well, I haven't been quite as up with the play in terms of reviewing and posting my thoughts on the various new-to-me authors and books I have been reading from all around the world, including: Thailand (John Burdett's BANGKOK EI8HT), Ancient Egypt (PC Doherty's THE ANUBIS SLAYINGS), Botswana (Michael Stanley's A DEADLY TRADE), and the Navajo reservations of Southwest USA (Tony Hillerman's A THIEF OF TIME). So there might be something of a flood of 'entries' from me in the coming week or so, in terms of catching up on all of those reviews. For my first book, which is part of my 2010 Global Reading Challenge, I read Bernhard Schlink's SELF'S MURDER, a German-set story translated from the German original by Peter Constantine. Author Schlink is a German judge-turned-novelist who is perhaps most well-known for his book, THE READER (turned into an Oscar-winning film starring Kate Winslet and Ralph Fiennes). As it becomes clear that the sleeping partner is in no way the most mysterious aspect of the bank's history, Self begins to suspect his mission may have been but a ruse to lure him into the shady world of the bank's enigmatic masters. Trying in vain to extricate himself and his increasingly shaky heart from the web of deceit - and to work out who really is the baddie of the piece - Self is thrown headlong into a tale of money-laundering, murder and mafiosi. But who is blackmailing whom? Did Welker's wife really die in a tragic accident? And why is a washed-up old Stasi man pretending to be Self's long-lost son?" I found the book okay, but not great. I kind of enjoyed it, but was left with a feeling that it could have been so much better. My full 550-word review of SELF'S MURDER has just been put on the EuroCrime website, and you can read it here.